Apple has made an agreement with the French government to make a payment reported to be around 500 million euros ($571 million), to cover back taxes owed by the iPhone producer to the country, following the completion of a lengthy audit. In what seems to be a continuation of a crackdown on tax manipulation and minimization by governments around the world, the deal reached by Apple will see it make a payment towards its back taxes. While local reports do not indicate whether it is for the full amount believed to be owed to France, the 500 million euros is likely to have made a considerable dent in the figure. Apple's regional operation in France confirmed to Reuters there is a tax agreement in place, but declined to state how much it would be paying. "As a multinational company, Apple is regularly audited by fiscal authorities around the world," a statement from Apple reads. "The French tax administration recently concluded a multi-year audit on the company's French accounts, and those details will be published in our public accounts." 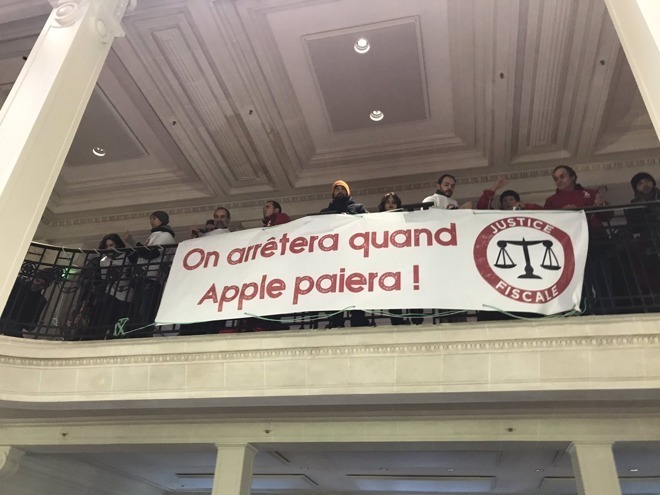 Apple's payment is likely to be welcomed by critics such as Attac (Association for the Taxation of Financial Transactions and Citizen's Action), which have protested against Apple's tax-related activities in stores over the last few years. The European Commission ruled in 2016 that Ireland had provided preferential tax treatment to Apple for multiple years, and demanded Apple pay back billions in taxes. Apple has since paid the entire 13.1 billion euro balance ($15 billion), including 1.2 billion euro in interest, into an escrow account controlled by the Irish government, while the ruling is being appealed by both Apple and Ireland itself. The Commission has also outlined proposals to force digital media companies to pay fairer taxes in the European Union, based on where revenue is generated rather than the country of its European headquarters, in order to close loopholes where firms shift money to areas with lower levels of tax. Individual countries, including the UK, have made proposals to enact their own tax rules to perform a similar function, until a potential Europe-wide version is enacted. France is also implementing another tax against the biggest tech companies, with the "GAFA" tax believed to haul in an estimated 500 million euro in 2019 alone.